Above Left: At the top of the long driveway a large motor court opens to the front of the house. The property's deep setback offer privacy and further emmerse the house in its surroundings. Above Right: Honed black basalt tile surrounded by river rock create a path from the motor court to the front door. 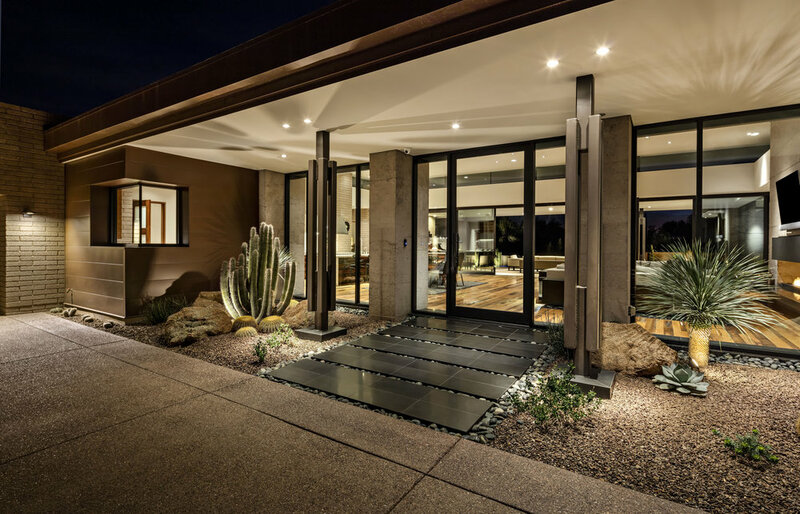 Desert landscaping frames the front entry of the house. 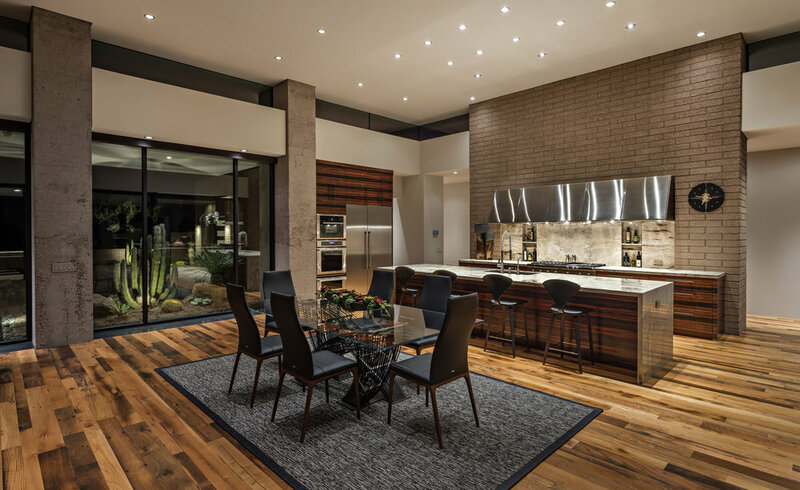 Right: The spacious great room seamlessly blends the kitchen, dining, and living room into one space that opens to the exterior rear patio and pool area. The sofa console table built by Flux Designs features a design mirrored on the coffee table. A custom hand-knotted area rug imported from India along with the custom made sofa are complimented by a 10 foot fireplace. A collection of paintings by local artist Dyana Hesson populate the spaces throughout the house. Above Left: Ebonized cabinetry continue the theme of horizontal lines at work throughout the interior of the house. Large motorized doors retract opening the great room to the patio and pool area. Above Right: The 13 foot stainless steel hood hangs above a quartzsite back splash with built in shelving. A 13 foot onyx island and classic Norman Cherner barstools complete the kitchen. Left: A corner guest bedroom offers unparalleled panoramic views of the dramatic landscape of the Estancia Club. A sliding door provides easy access to the pool area and patio.